Suunto Traverse Alpha measures your daily steps and estimates calories burned during the day based on your personal settings. 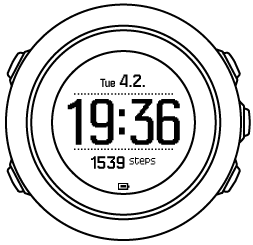 Your approximate daily step count is available as a default view in the time display. Press VIEW to change to the step counter view. The step count is updated every 60 seconds. 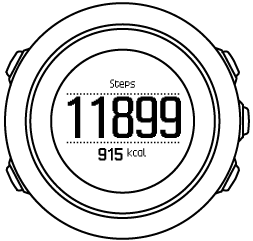 Daily step count and calories burned are displayed under DISPLAYS » Steps. The values are reset daily at midnight. 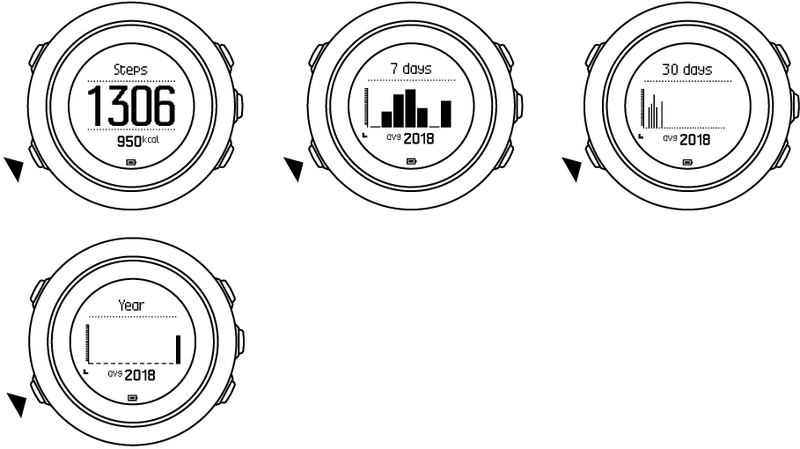 Activity monitoring is based on your movement as measured by sensors in the watch. The values provided by activity monitoring are estimations and not intended for medical diagnostics of any kind. Suunto Traverse Alpha provides a complete history of your step count. The step display shows your daily steps, as well as an overview of weekly, monthly and yearly trends. You can show/hide the step display from the start menu under DISPLAYS » Steps. When activated, you can view your step history by pressing NEXT to scroll through active displays. While in the steps display, you can press VIEW to see your 7-day, 30-day and yearly trends.